Create the longest chain ever! Targets are initially empty, but getting filled when you're collecting chains of the corresponding type. A filled target disappears - so when all of them are gone, the level is won! Simple targets are the easiest to remove. Just collect any chains and fill the targets. Neither color nor lenght of chains are important. Numeric targets have a number in the middle. This number indicates the minimum lenght of chains you have to collect in order to fill such a target. Color of chains is not important as well. Color targets are filled when you're collecting chains of the corresponding color. Lenght of a chain is not important. Fall targets are not supposed to be filled. Instead, falling items appear on the field, and you have to let them reach the most bottom line of the field. Once falling item is there, it disappears with the target. Mac OS X 10.6.8 (Snow Leopard) or newer. 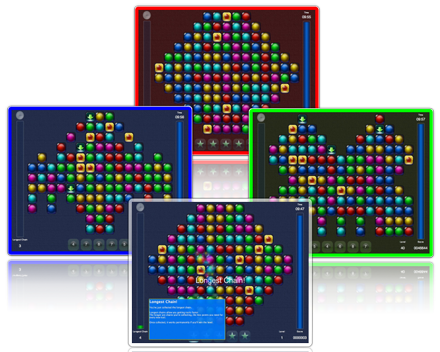 Chain Reaction - The #1 bubble chain arcade puzzle game for PC and Mac OS X.